The hot news from CERN (The European Organization for Nuclear Research) in Geneva, Switzerland, is that its Large Hadron Collider is operating at its highest level and could soon detect miniature black holes that might open up into a parallel universe. At the same time, news reports about floating cities over Foshan and Jiangxi in China and now Hastings in England have already been referring to them as visions from or portals to a parallel universe. Are any or all of the reports true? Has CERN already secretly opened a portal to a parallel universe? Is it time to panic? The dimensions of our own universe are length, breadth, depth and time. The CERN physicists believe that by increasing the energy of the LHC, mini black holes could be opened into an extra dimension. Theoretically, the only thing from our universe that can travel to or leak into an extra dimension is gravity. So if they detect gravity going into the mini black holes, theoretically they’ve proven the existence of extra dimensions. What else might happen after that is what has many in a panic. Gravity also plays a role in the sightings of floating cities in China and England. While the most commonly-accepted explanation for the sightings is the optical illusion known as Fata Morgana, many people believe the floating (gravity-defying) cities are images of parallel cities in more traditional parallel universes where everything in our universe exists but in a slightly (or dramatically) different form. 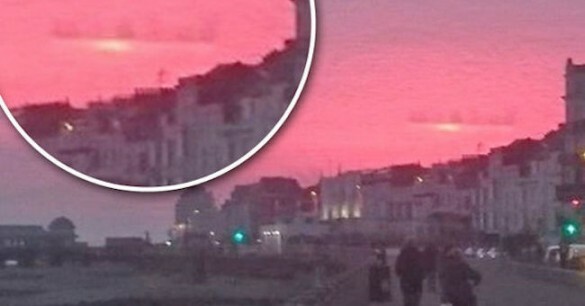 The image of a city floating over Hastings was quite high in the sky and seen by many witnesses. Coupled with the recent stories of the Chinese ghost cities and the controversial, secretive and difficult-to-understand experiments at CERN, it’s easy to see why portals to parallel universes created mysteriously by nature or by secret experiments are just as believable as a particle accelerator, a mini black hole and a Fata Morgana.